Welcome back to the 4th instalment of our new post series – My Product Showcase. Those of you who have been with me for the long haul may remember that ChatWithAndrew.com was actually my main blog for quite a while, back when I was running multiple blogs at the same time, split by overall topic. Thankfully though I soon realised how impossible that was, and AndrewMinalto.com was born… truly one of the best decisions I’ve ever made! But while I don’t post on CWA any more, you can still order chat sessions with me from there. The process is incredibly straightforward – you simply purchase either a one hour or two hour chat session with me and we then set up a time to talk! In terms of pricing, a one hour session is £67 and I offer a hefty discount for two hours, which costs just £97. For the chat itself, we’ll use my own online based live chat software, which means there’s nothing for you to download and install. eBay – products, templates, listings, search rankings etc. eCommerce – shopping carts, design, etc. Branding – business and domain name, logo, overall concept, etc. Importing – suppliers, scams, tax, shipping, etc. Marketing – SEO, PPC, affiliate programs, building a list, etc. Brand name creation session – where we’ll work together to come up with the perfect brand name for your new business. Product evaluation – we go over potential products that you’ve found, and I’ll assess them with you, work out the margins, potential profitability etc., to make sure you’re choosing the right niche. Supplier evaluation – we can search for potential suppliers and analyse them together. SEO – we can create a complete SEO plan for your online store, including what you need to do, what providers to use, what budget to set and much more. Listing perfection – I can go over your eBay listings and suggest tweaks and changes that will give you a higher conversion rate and therefore more profit! The opportunities are endless here and I hope that by creating these packages, my readers will really start to see the value in these chat sessions. And that’s pretty much it! 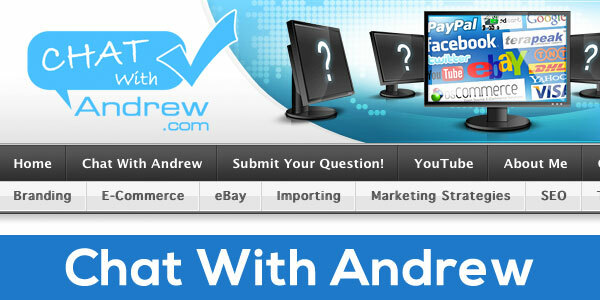 It’s a very simple and straightforward offer, and I just wanted to give a quick overview of it and to let you know that ChatWithAndrew.com is still alive and well! We’ve now covered 4 products/services so far, and next week will actually be the last post in this series. Long time readers probably already know what’s going to be showcased next week? Yep, it’s Spicy Auction Templates and I’m actually very excited for this one, in light of the big upgrade that I recently announced.